The UUSI web site describes their latest production as a divination medium. But surprisingly, the BruT Tarot looks more than a regular 78 cards pack of tarot as played in Europe. Only the trump cards have been inspired by the Marseille Tarot. 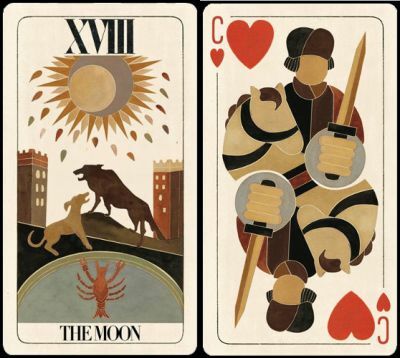 To be honest, in the Kickstarter campaign, the authors informed us that Tarot can be played in many trick-taking games and they chose to use the modern, French suits instead of the older Latin suits as they wanted this pack to be as multifunctional as possible. All cards have been designed by Peter Dunham from hand painted illustrations by Linnea Gits. 3000 packs are expected to be printed in November 2015.